Share the post "Highlighting Rutgers’ Two Markets During National Farmers Market Week Aug. 2–8"
NJ Secretary of Agriculture Douglas H. Fisher, center, during a visit to the Rutgers Gardens Farmers Market in 2015 as part of his two-day “Jersey Fresh Love Tour,” making stops at farms, farmers markets and wineries to highlight the peak of Jersey Fresh season in the Garden State. 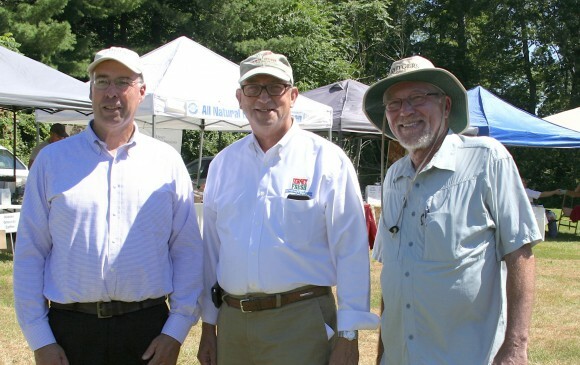 He’s accompanied, at left, by Bruce Crawford, director of the Rutgers Gardens and, at right, by Bob Goodman, executive dean of agriculture and natural resources at Rutgers. Photo by Lisa Mutnick. Aug. 2–8 is designated “National Farmers Market Week” in an official proclamation signed by U.S. Secretary of Agriculture Tom Vilsack. This year marks the 16th annual National Farmers Market Week in honor of the important role that farmers markets play in local economies. An August 2014 USDA National Farmers Market Directory graph shows more than 8,000 farmers markets across the U.S., with steady growth each year. In New Jersey, there are currently more than 150 community farmers markets, listed in a searchable database maintained by the New Jersey Department of Agriculture (NJDA). Rutgers University–New Brunswick has two of these seasonal markets that sell Jersey Fresh produce directly to consumers, as well as provide access to nutrition information through Rutgers Cooperative Extension. 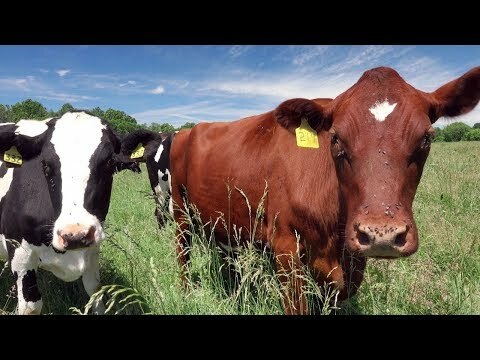 The Jersey Fresh program was developed in 1984 by the New Jersey Department as a way to identify to consumers produce grown by New Jersey farmers. 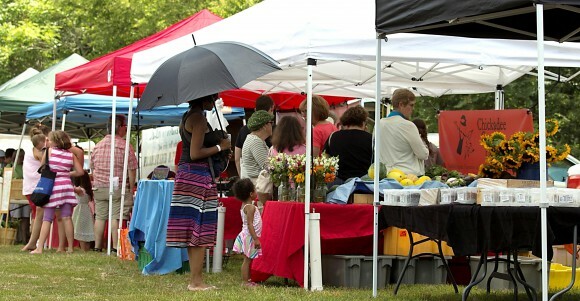 The first market to open was the Rutgers Gardens Farmers Market, which was established in 2008 at the university’s botanical gardens located off Ryders Lane in New Brunswick. The market operates from May through November and its mission is to provide the local community, including residents, students, university faculty and staff, University Dining Services and restaurants, the opportunity to experience and purchase fresh, locally grown and prepared food products. A busy day at the Rutgers Gardens Farmers Market. Photo by Jeff Heckman. “Farmers Markets continue to rise in popularity as more and more of the community better understands the importance of locally grown and prepared foods,” said Bruce Crawford, director of Rutgers Gardens, who oversees the weekly farmers market. “Not only are these products fresher, tastier and actually more nutritious than food that is shipped long distances, it also helps to reduce the carbon footprint since the distance to the consumer is obviously far shorter,” he added. The market has steadily grown, with currently more than 30 vendors providing a wide range of freshly harvested produce and prepared foods, including dried fruits and nuts, Thai food, cheeses, granola, wines, honey and beeswax products, jams and pickles. Among the vendors is the Rutgers Animal Care Program Farm Sales, which offers a variety of locally raised meats like pork and beef, and seasonally available goat and lamb. This year, the market added a CSF or Community Supported Fishery run by Heritage Shellfish Cooperative to provide locally grown or responsibly harvested seafood. Over the course of 20 weeks, customers who’ve signed up, receive bi-weekly shares of fresh local seafood based on availability. The CSF at Rutgers Gardens Farmers Market is a new, collaborative effort between Rutgers Cooperative Extension of Ocean County and the Heritage Shellfish Cooperative, with the assistance of Keystone Development Center. 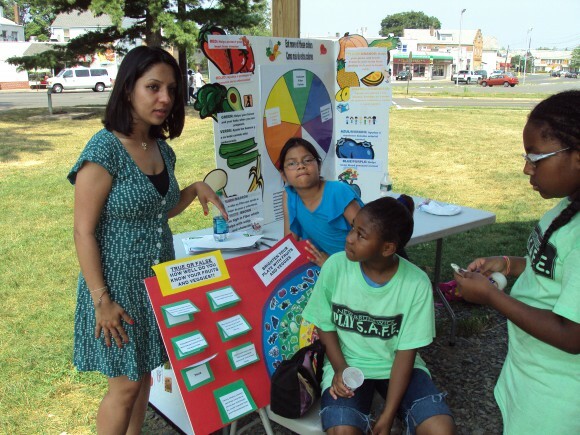 As part of its mission, Rutgers Cooperative educators deliver nutrition education sessions at the NBCFM. Extension, Johnson & Johnson and the city of New Brunswick. It was launched in 2009 with the support of a grant to Rutgers by Johnson & Johnson, the health care products manufacturer whose world headquarters are located in New Brunswick. This farmers market is among the many community-based initiatives of Johnson & Johnson that help to improve the health and well-being of residents. “The farmers market was established to provide Jersey Fresh produce to residents, especially those who are at risk for food insecurity,” said Sarah Dixon, coordinator of the NBCFM. “We’ve provided thousands of dollars of fresh produce to families working with tight budgets, and the gardens offer a space for residents to grow their own food and connect to the sources of food that inspire us to eat healthy,” she added. NBCFM was conceived to serve neighborhoods that have limited access to a variety of nutritious fresh foods and food education. Consumer educators with Rutgers Cooperative Extension help provide on-site information and instruction to reinforce healthy eating habits, economical food budgeting and food safety practices. In addition, the market has involved local residents in multiple ways, through community gardening in the Esperanza Community Garden, growing produce for donation to local food pantries, and growing marigolds for Dia de los Muertos. Community gardeners and market staff also keep an apiary, vermicomposting bin and chicken coop with egg-laying hens on site. 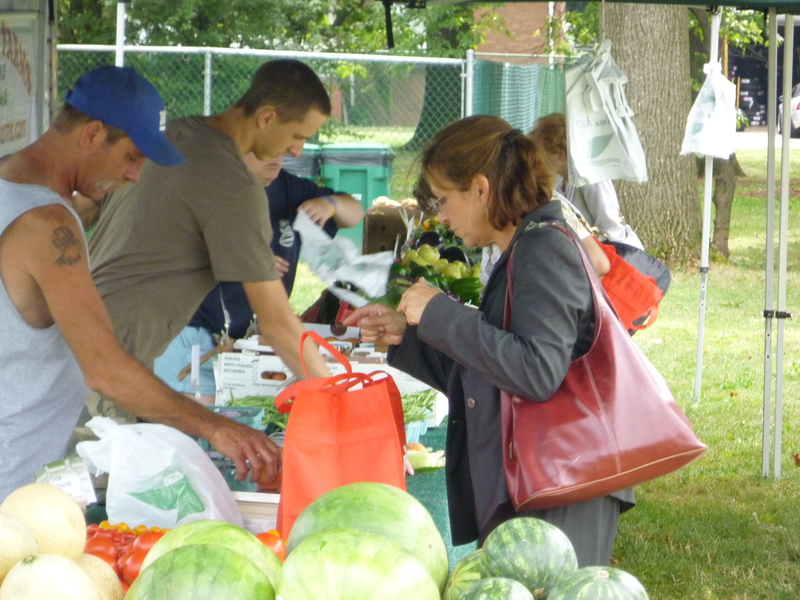 Residents shopping at the New Brunswick Community Farmers Market. The NBCFM also supports nutrition and cooking education, gardening, and access to healthy local food through a partnership with FoodCorps. The FoodCorps Americorps service member with the NBCFM works in local schools and preschools to teach healthy habits, and to connect kids and families to local food. It operates from June to November and maintains three locations: the original Jones Avenue market and pavilion (open Thursdays and Saturdays); Kilmer Square Park at the corner of George and Albany streets in downtown New Brunswick (open Wednesdays); and a location on the George H. Cook campus during the early Fall semester for Rutgers students seeking access to fresh produce.